​"Always the Last Weekend in April"
​Let the adventure begin! According to legend, an angel has to plant the seed of the red fern, and so wherever there is a red fern, it marks something very admirable and special. Many folks that make Tahlequah and Northeast Oklahoma their home feel a special connection to the area. Whether it's been touched by angels, divine intervention, or it's part of God's plan, whatever it is, there is something special about Tahlequah. This map marks food vendors locations. You can expand the map by clicking in the upper right-hand corner. To view the legend click in the upper left-hand corner. Beauty: A winner will be crowned in each age group and will receive a crown and flowers. · Attire for category: Sunday’s best, semi-natural hair and make-up. Favorite storybook character: there will be a winner crowned in each age group that will receive a crown and flowers. · Attire for category: dress as her favorite storybook character. Each girl will be asked to explain why it is her favorite storybook character on stage. Talent (optional): a winner will be crowned for each age group that will receive a crown and flowers. · Attire for category: contestant’s choice of attire. The Hound Dog Field Trials will be held on Park Avenue right behind the Armory Municipal Center, at 201 E. Delaware Street. Registration is at 10 am Saturday morning. The 5C's Car Show is back again. Located on the Cherokee Square in Downtown Tahlequah. Original and modified automobiles from decades past come together on April 27th for all to see. Show entries are judged by paid professionals chosen from area auto body shops and garages. Entries compete in 32 categories, including original and modified cars, original and modified trucks, Mustangs, Rat Rods, and muscle cars. Each category awards first and second prizes. The 5C's Car Show gives visitors and car enthusiasts the opportunity to visit with show participants. If shiny chrome, boss paint jobs and the cherry rides are your thing, you won't want to miss Red Fern Festival's 5C's Cruisin' Classic Car Show. "These folks put so much time and effort into their vehicles, and absolutely love to share that enthusiasm with others," said Jon Edwards, 5C's club president. Take a stroll back in time and revisit old memories at the 5C's Car Show. Call Jon Edwards at 918-822-0074 or email at jonedwards@5ccarclub.com to register. All Proceeds will be donated to the Cherokee County Angel Tree! Tickets are $5.00 at the festival. Register your world famous chili here! Downtown Tahlequah is home to wide variety of mom and pop shop's. Felts Family Shoe Store has been in business downtown for 79 years. Not far behind is Morgan's Bakery, they opened their doors in 1948. There's a bike shop, barber shops, brewing and grilling supplies, jewelry stores, a men's clothing store, western wear, boot repair, skateboards, fine art galleries, a jazz lab and a playhouse, cookware and acupuncture, bacon & eggs, burgers and steaks, coffee and tea, something healthy if you please, nutrition specialists, gaming gurus, boutiques, and wedding gowns and something for prom, a place to pawn, places to eat, places to drink and a place to buy things made in Tahlequah. All unique and different in their own special way. Most importantly they are all locally owned. 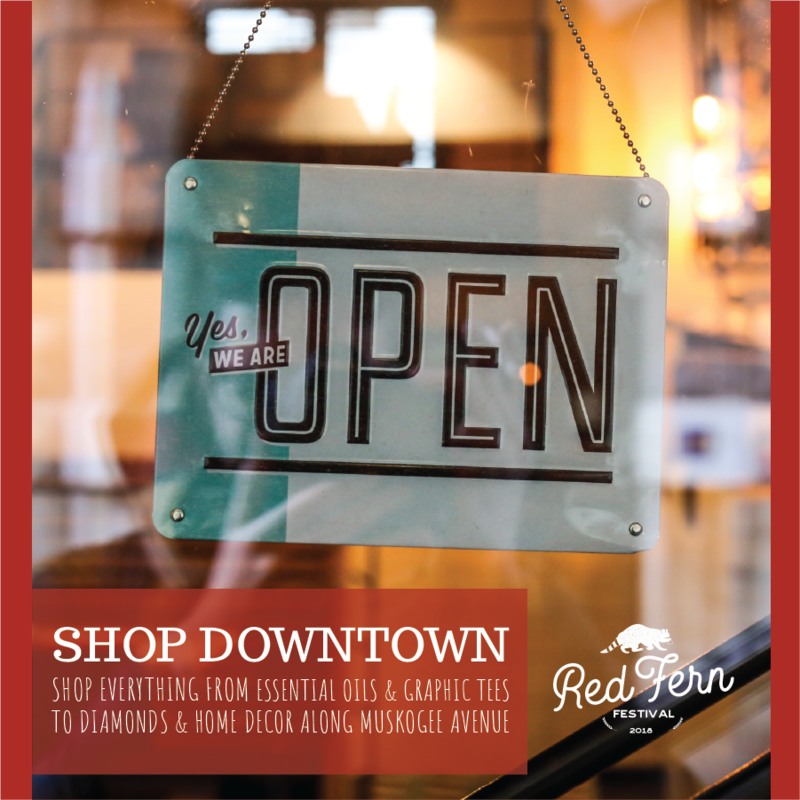 Shop and Dine in beautiful historic downtown Tahlequah during Red Fern Shopping Days, you'll be glad you did.